IHS iSuppli reports AMOLED display shipments for mobile handset applications are expected to grow to 447.7 million units in 2017, up from 195.1 million units in 2013. 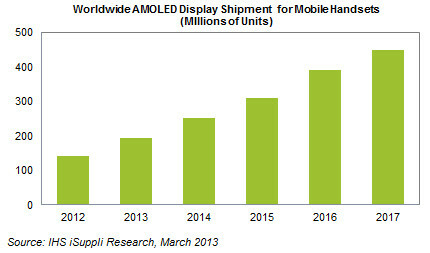 Within the mobile handset display market, the market share for AMOLED displays is forecasted by IHS to grow from 7.9 percent in 2013 to 15.2 percent in 2017, as presented in the figure below. AMOLED’s market share for 4-inch or larger handset displays employed in smartphones is set to increase to 24.4 percent in 2017, up from 23.0 percent in 2013, as per IHS. IHS says the new Galaxy S4 from Samsung Electronics has spurred the market for these high-quality displays to more than double by 2017. For its new premium smartphone, Samsung Display—the AMOLED display supplier for Samsung Electronics—increased the AMOLED pixel format to 1920 by 1080 Full High Definition (Full HD), up from 1280 x 720 WXGA present in the Galaxy S III. Part of Samsung’s popular Galaxy line, the S4 joins several high-end smartphone models from other manufacturers also featuring 1920 by 1080 resolution but distinguished by an important difference. The other handsets use thin-film transistor LCD (TFT-LCD) displays, while the Galaxy S4 is the first Full HD smartphone utilizing an AMOLED display. Among the handsets with 1920 by 1080 TFT-LCD panels are the 4.8-inch HTC One, the 5.0-inch Sony Xperia Z, the 5.0-inch ZTE Grand S, the 5.0-inch OPPO Find, the 5.5-inch LG Optimus G Pro and the 5.5-inch Lenovo Ideaphone K900. The high-resolution mobile handset display market is currently dominated by Low-Temperature Polysilicon (LTPS) TFT-LCDs, which accounts for the entire Full HD mobile handset display market. Reaching the high-resolution point with true pixel densities greater than 300 pixels per inch (ppi) has been a challenge for AMOLED displays, as it is difficult to achieve dense pixel arrangements using the conventional Fine Metal Mask process while still securing enough display brightness and not compromising power consumption. Samsung Display, however, was able to enhance AMOLED display performance by implementing two new technologies in addition to its existing Fine Metal Mask process. The maker succeeded in increasing the lighting area in AMOLED panels with its new structure of Pentile matrix, and it used phosphorescent material for the green subpixels, allowing better light management and lower energy consumption. As a result, the AMOLED display was able to achieve a denser pixel arrangement, boosting its pixel density to greater than 400 ppi and resulting in 1920 x 1080 Full HD display in the Galaxy S4. This compares to 1280 x 720 WXGA in the Galaxy S III, 800 x 480 WVGA in the Galaxy S2 and 1280 x 800 WXGA in the Galaxy Note. The higher pixel density provides sharper and more defined images, while being able to display more content on a smaller display area. Samsung also implemented the Floating Touch system in Galaxy S4, allowing users to interact with the touch screen by letting their fingers hover a few inches away from the display. By combining mutual capacitance, the on-surface normal touch sensing and self-capacitance, the Floating Touch in the Galaxy S4 expands the user experience of the display. It also detects touch inputs from gloved hands, a feature that was first introduced through Nokia’s Lumia 920 in 2012. Galaxy S4 will be the first Full HD AMOLED display offering in the market. However, material lifetime, color balance and limited supplier base still need to be addressed for a larger market presence of OLEDs and stronger competitiveness against LTPS TFT-LCDs.